I've said it before, I'll say it again. What I love most about quilting is the friendships I make! Before going to the textile Museum (more on that Monday) I had a chance to visit with Laurie and see some of her "new" acquisitions and her recent sewing projects. Look at this amazing princess star antique quilt! I love that the quiltmaker quilted the hanging diamonds directly over the applique! This was a beautiful crib quilt with fantastic Prussian blues and that tiny scalloped binding! I've tried to copy her decor ideas, but cannot pull it off quite like she does!! She is putting rows together. WOW! After lunch in LaConner, we met Merry at her house where she offered me her Accuquilt Go. Of course, it is so fun to see a quilters home! Merry has been part of the little quilt swap and I thought it was pretty darling how she had them displayed. On her design wall she was working on this fun self portrait! She shared with us the most precious story about 2 yo-yo quilts in the flower garden style her grandmother had made. One, from a neighbor friend, was given back to Merry to keep in the family. It was so unique and fun to look at! It was truly a labor of love! The fabrics were fun to get an up-close and personal look at. And she was happy to make some space in her garage! My question for you who use this, where is the best place/price to get dies? I would like the get ones that do strips. Last week I made this comment on my Abe Lincoln post, " It has a lot of brushed cottons" and a reader asked me " I would like to understand what a brushed cotton is. I don’t recall that term when I have shopped for fabric - so just curious." If one person asked, than I'm sure there are a few more that don't know either. In order to see the below fabrics well, you'll likely need to view them on something larger than your phone. Here is one side of a homespun. It isn't as thick as flannel, but somehow in the process the fibers are raised creating a "brushed" look and feel. Here is the exact same piece of fabric only it is the other side that is not brushed/raised. I love using the brushed fabric to make the quilt softer and more snuggly, without it being a thicker flannel quilt. Oh la la... how many beauties !! Thank you for sharing ! For the bottles of wine I don't think it's the best way to reserve them ! Except if they are drunk quickly !! ah ah ! You had quite a weekend! I have a small pile those brushed cottons. Maybe I should send them to you. Die cuts, I buy from the company. Often times they have great sales. Love my Accuquilt, unbelievable how fast I can cut out a quilt top. Also. 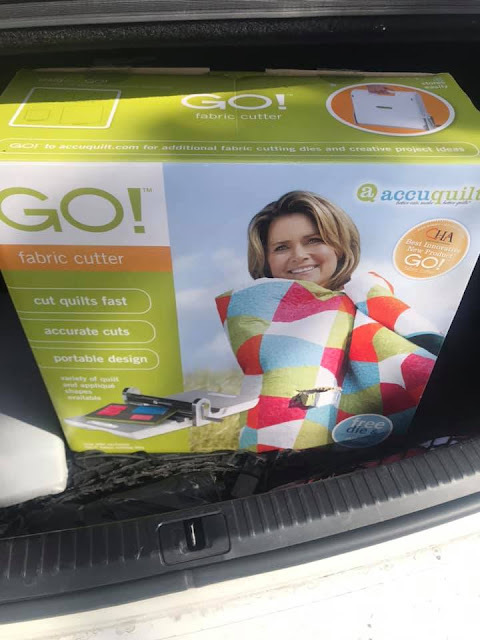 join the accuquilt Facebook, often people are selling their die cuts. 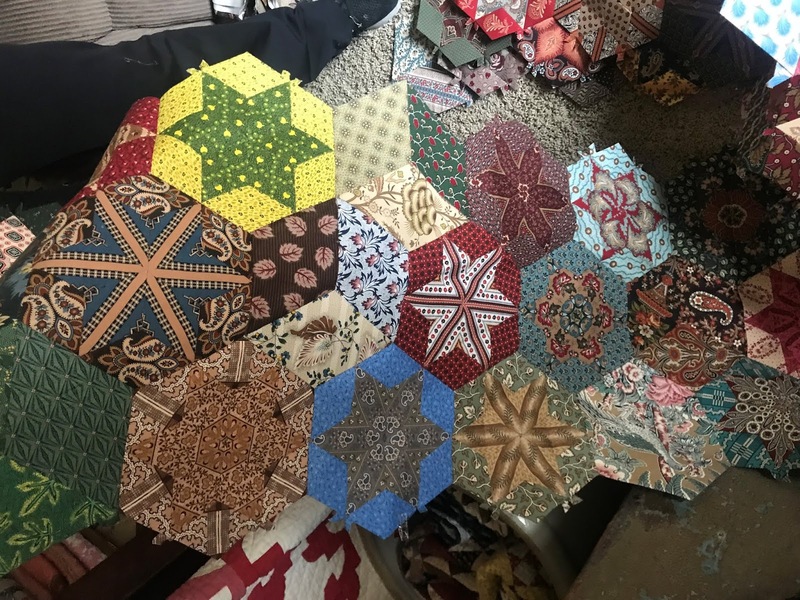 It does get you excited and motivated when you get to see a friends awesome quilt collection. When the popularity of the Go Cutters first happened, the company gave me a free one to try and do a review on. I never used it beyond the initial trial so I donated it to a church thrift store. I know many people really like using them but I did not have a lot of use for one with doing so much applique. Yoyo hexies = mind blown! It is such fun to spend time with quilty friends!! OMG, I made a little pinwheel quilt like the middle one above the wine rack. I also have used and am using that green striped brushed cotton you show to explain what it is. If I recall right, I got it at the Quilted Moose in Gretna, Nebraska. They carry lots of homespuns and brushed cotton. The yo-yo quilt great gramma made is pretty spectacular and yes, the wines are rotated out (and shared), way faster then my fabric stash. Hi Lori, thanks for sharing all the wonderful quilts. Such an inspiration!!! You are so right about Friendships being one of the best parts of quilting! Thank you for sharing photos of these beautiful quilts! What a great trip you had! You saw some amazing quilts. And so much fun to see others' quilting rooms! Glad you got the device! Ooolala....thank you for the quilt show. I loved them all and liked seeing how they are displayed. I am on the accuquilt mailing list, so I get notified when they are having a sale. There's usually a big sale around Black Friday. But, I didn't know about the FB page, so I will check that out. Have fun! The two quilt tops are amazing! Love them. And the Princess Star is absolutely stunning. Wonderful to have quilty friends for sure! Thanks for the display of quilt pictures. Very enjoyable. Thanks for the explanation about brushed cotton. Sometimes I wonder which is the right side of a fabric. Then someone told me you can use whichever side you want. lol. As someone else mentioned about the Go Cutter. Look on their website. Great post Lori! You know I LOVE seeing antique quilts! It was also delightful seeing the quilt I sent Merry a few years back! Oh, my goodness, I love this display of vintage and vintage-looking quilts! The displays are so inviting. Drooling here. Lucky you with the Go cutter. Your quilty friends are so very talented! Thanks for sharing their quilts. The yo-yo quilts are very interesting, family heirlooms for sure. I have a Go cutter and have only used it for strip cutting. I bought dies from the company itself and Ebay.